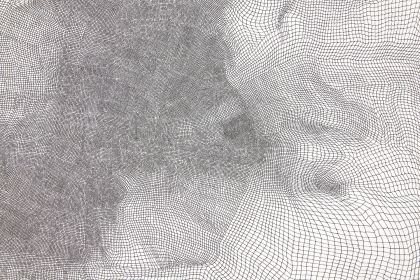 (New York, NY) Acquavella Galleries is pleased to present Jacob El Hanani Drawings, its first exhibition by the artist, from April 15 – June 12, 2015. El Hanani has produced highly detailed drawings utilizing the tradition of micrography since the early 1970s. This painstaking process is an ancient Hebrew art form developed in the 9th century that involves the repetition of small marks to create intricate abstract designs. Using this technique, El Hanani repeatedly draws thousands of microscopic marks, at times Hebrew letters, onto paper or canvas. The artist can take months or even years to complete individual works, which are evocative of highly detailed geographic maps, carefully woven textiles, and celestial bodies. “We are thrilled to be exhibiting the work of Jacob El Hanani for the first time,” said Eleanor Acquavella, “it is an honor to present the work of an artist who has devoted his life to intricacy and an extraordinary attention to detail. From afar these works appear abstract but when the viewer gets closer, beautiful, intricate patterns are revealed.” This presentation will include eighteen drawings installed in the gallery’s second floor space, and coincides with the group exhibition Off Canvas: Drawing, which will be installed on the floor below. Jacob El Hanani (b. 1947) was born in Casablanca, Morocco, and was raised in Israel. His work can be found in the permanent collections of institutions including the Museum of Modern Art, New York; Metropolitan Museum of Art, New York; Solomon R. Guggenheim Museum, New York; National Gallery of Art, Washington, DC; Jewish Museum, New York; Art Institute of Chicago; Museum of Fine Arts, Houston; Tel- Aviv Museum, Israel; and the Musee National d’Art Moderne, Centre Georges Pompidou, Paris. A fully illustrated catalogue featuring a forward by Eleanor Acquavella and an essay by Arthur Danto will be published on the occasion of this exhibition.